“Tell me how you read and I'll tell you who you are.” Martin Heidegger said these words with conviction. He was very well read and educated by the best teachers of his time, and his written works reflect his erudition and his genius. Martin Heidegger is arguably the most important philosopher of the 20th century. He pointed out the essential flaw in the binary thinking (e.g. mind / body, inner / outer, subject / object, etc.) dualism of Descartes’ ontology and the subsequent Cartesian hegemony of our times. Heidegger masterfully negotiated a project of staggering scope: Reaching back past Cartesian dualism to Greek antiquity for the purposes of re-envisioning the question of the meaning of Being. For Heidegger, the question of Being’s meaning had never been addressed because it had never been properly raised. Rather, the question was raised by the highest and best thinkers of ancient Greece, but was eventually mistaken by giving precedence to Being as substansia (literal things) and the categorization of those things. But giving priority to substance-things covers over, if not completely ignores, the meaning and ground of Being, which is its possibility-for-being, its relatedness. Heidegger went on from there, boldly restructuring the history of ontology (the study of the meaning of Being) in his magnum opus Being and Time with particular attention, in his later work, to the destructiveness of technological disclosure of the earth and humanity. His highly original and powerful work has had reverberations through every field of natural science and the human sciences. His works, while brilliant, are labyrinthine as well as timeless. 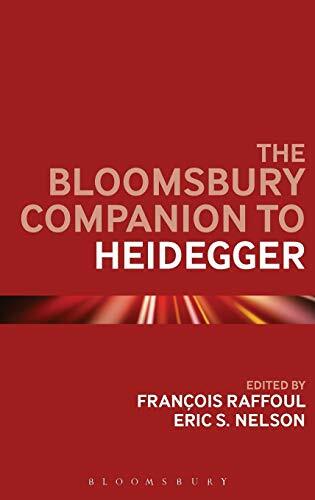 The Bloomsbury Companion to Heidegger edited by Francios Raffoul and Eric S. Nelson is a most important work to appear in contemporary Heideggerian scholarship. It contains 58 chapters written by more than 60 leading experts in the field. This tome explores Heidegger’s work in the following fashion: Life and Context, Sources, Influences, and Encounters, Key Writings, Themes and Topics, Reception and Influence. Their insights into Heidegger’s written works reflect the time and patience needed to more fully understand the complexities and subtle nuances of Heidegger’s thinking. What makes this arrangement so brilliant is the nod given to history. The first part of this book deals with Heidegger as a man, his time and his evolution—a biography of sorts. It is important to understand this contextualism in order to fully understand Heidegger. Furthermore, it is important to understand Heidegger’s influences throughout his life. It is these elements that shaped his thinking, forming ideas and theories which still hold today, making his works timeless. Later, the contributors make fascinating inroads into Heidegger’s import into the various fields of the natural and human sciences, including an especially seminal piece by Robert Stolorow on Heidegger and post-Cartesian psychoanalysis. The Bloomsbury Companion to Heidegger is a brilliantly written companion to Heidegger’s original works, offering a map of his writing through insight, reflection, and understanding. These chapters will enlighten and encourage anybody interested in the scholarly works of Heidegger as well as the philosopher’s impact upon the sciences and humanities today. Dr. Brent Potter is a Psychotherapist and author of the book Elements of Self-Destruction. He is the Director for the Society for Laingian Studies and the R. D. Laing Institute. Topics of his many articles include innovative and effective mental healthcare models, existential-phenomenology, psychoanalysis, the psychotic register of the mind, character and personality disorders, chemical dependency, and child/adolescent mental health concerns.